All server controls have a property called ViewState. This is defined in the Control class as the type StateBag, and allows server controls to store and retrieve values that are automatically round-tripped and recreated during a postback. When a postback occurs, ASP.NET decodes the_VIEWSTATE hidden field and automatically repopulates the viewstate for each server control as they are created. 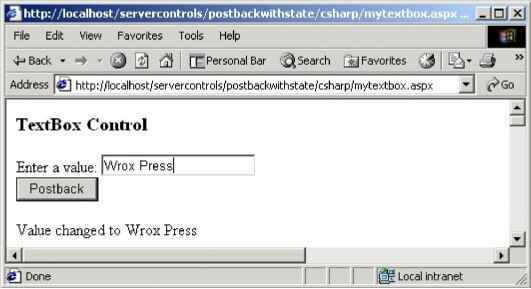 This reloading of state occurs during the load state stage of a page for controls that are declared on an ASP.NET page. 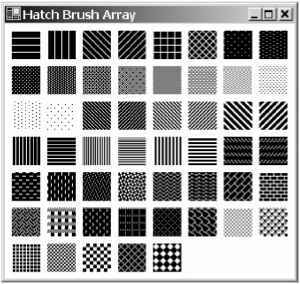 If a control is dynamically created, either on a page or within another composite control, the state will be loaded at the point of creation. ASP.NET keeps track of what viewstate hasn't been processed, and when a new control is added to the Controls property of a Control (remember a page is a control), it checks to see if it has any viewstate for the control. If it has, it is loaded into the control at that point. To see viewstate in action, we will change our textbox control to store its current value in viewstate, rather than the _value field. By doing this, when LoadPostData is called to enable our textbox control to retrieve its new value, we can compare it to the old value held in viewstate. If the values are different we will return true, causing a TextChanged event to be raised in RaisePostDataChangedEvent. If the values are the same, we will return false so RaisePostDataChangedEvent is not called, and no event is raised. The StateBag class implements the IDictionary interface, and for the most part is used just like the Hashtable class with a string key. All items stored are of the type System.Object, so any type can be held in the viewstate, and casting is required to retrieving an item. 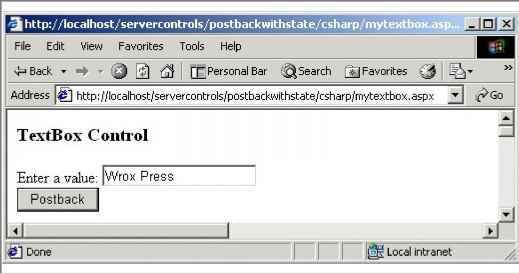 During the save state stage of a page, the ASP.NET page framework will not persist viewstate for the controls with an EnableViewState property of false. This change to the page will therefore make our label forget its value during each postback. Setting EnableViewState to false does not prevent a control from remembering state using postback. As such, should you need to reset the value of a textbox, you'd have to clear the Text property in a page's init/load event.